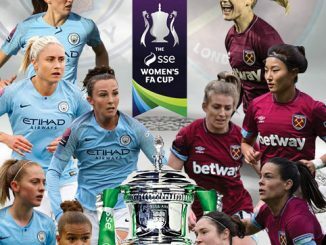 Louise Bradshaw: Although she has played well all season, she has unfortunately not been clinical in front of goal (although performance of course is not just about goal scoring!). Yesterday she was genius with her movement. 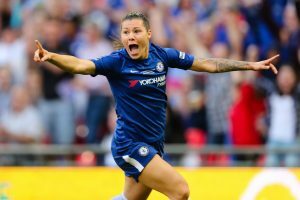 Robert O’Brien: Despite being Arsenal supporters, Ramona Bachmann and Chelsea bossed the game, and were deserved winners. Hopefully both teams will be back next year! Maisie Parker: Outstanding performance, with real drive and determination to help her team achieve the dream of winning. Mckenzie Darrington: In the first half she created a lot of chances down the right side and then got 2 quality goals in the second half. Louise Matthews: Well finished two goals, calm and collected but also added a lot more to the game apart from the goals. Great passing, held up the ball well. Rebecca Dickinson: Ramona worked tirelessly all game. Was either creating chances or scoring whilst also getting back to help in the defence. Add the two goals to that and there was no question for player of the match. Rachel Eaton: Inspirational for the team and really drove on in the second half to win it! What a player!! Helen Rolandsen: Hard working, skillfull. Attacked and defended when needed to. Her goals were unreal. Bethanie Dee: Never gave up the whole game, looked like she wanted to win the whole time and looked promising whenever she was on the ball. Becca Conway: Beth didn’t give up the whole game! Beth battled hard to get her team back nto the game! She left her heart and soul on the pitch! 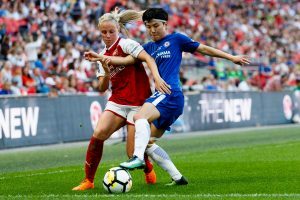 Helen Schofield: Fran Kirby’s exquisite curled shot sealed the game for Chelsea, effectively ending Arsenals hopes of a comeback. Toni Barnes-Warden: Non-stop and amazing goal. David Fox: Calm under pressure, always looking to create attack from defence. Becky White: Millie was as strong as always at the back, cleared everything up, got in front of players, a key player in the Chelsea setup! 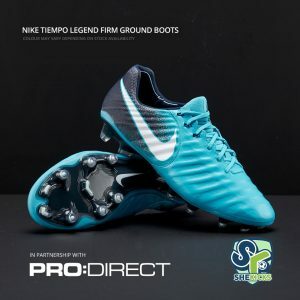 Thanks to everyone for taking part and the lucky winner of these Nike Tiempo Legend boots, kindly provided by our pals at Pro:Direct soccer, was Helen Schofield.